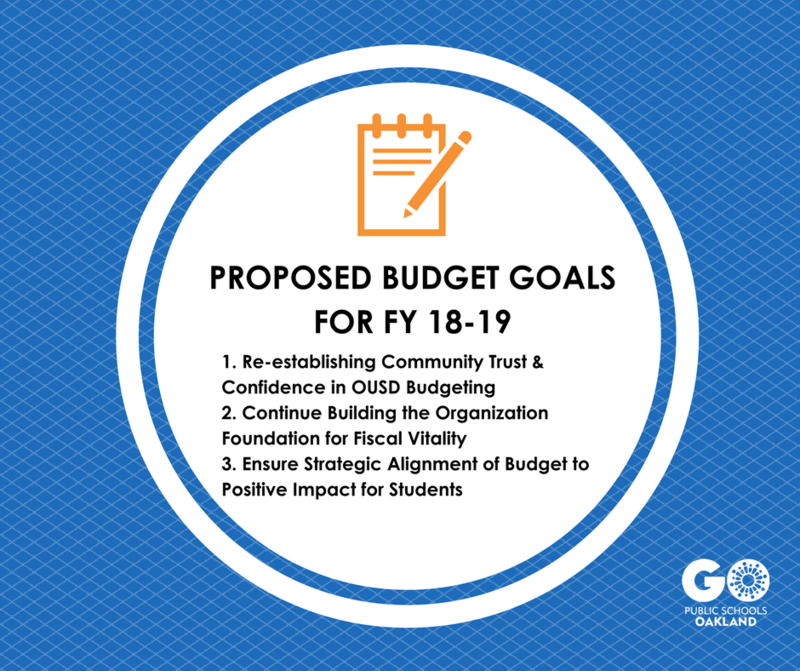 This year GO launched a Budgeting For Impact campaign to engage our network about the current fiscal challenges facing OUSD and the best practices that can be adopted to improve the district’s finances. (3) Ensure strategic alignment of budget to positive impact for students. Ensure no mid-year cuts for the 18-19 school year. The top concern of our network is that school sites are not disrupted for a third year straight with mid-year cuts. Each of the last two years, OUSD has discovered overspending of ~$6 million (2015-16) and ~$9 million (2016-17) which contributed heavily to mid-year cuts. Anticipate Actual Costs & Cost Increases. Fully anticipate actual cost of items with historic overages, i.e. SPED, ECE, Nutritional Services, as well as items with increasing costs, e.g. pension contributions, SPED costs, potential salary increases from collective bargaining. Set aside discretionary dollars beyond setting 3% reserve goal. Set aside ~$5M of discretionary funds for 2018-19 beyond the 3% reserve goal to ensure overages or unexpected expenses don’t reduce the reserve or lead to mid-year cuts. If these discretionary dollars are unspent in 2018-19, invest them in OUSD’s longer-term goal of a 5% reserve. Set & meet goals for restoring critical funds to appropriate levels to avoid state receivership. Articulate funding level goals for this fiscal year and beyond for critical funds, including but not limited to: Self-Insurance fund, Reserve for Economic Uncertainty, and the Health Benefits Governing Board Reserve. Allocate resources for 2018-19 accordingly. Is Oakland Unified simply classifying these expenditures differently from other districts? If so, do we have a good reason for the differing classification, which is confusing to community members examining public data? If this is not a classification issue, what is the justification for Oakland Unified’s disproportional investment in this area? What impact on students do we expect these expenditures to have? If there is not adequate justification, then what are the necessary steps and timeline to correct and better allocate our limited resources? Appropriately staff the finance department. Ensure that OUSD’s new Chief Business Officer and Chief Finance Officer have the the right positions filled and are building staff capacity to do their 2018-19 work, including fully resourcing necessary implementation of the district’s FCMAT findings resolution plan. Implement recently adopted board policies with fidelity. Key new policies include reserve policy, zero-based budgeting practices, structurally balanced budget policy, and improved budget presentation guidelines. Invest in necessary infrastructure. Be clear what investment remains to be made to improve financial management infrastructure and relevant communications, and invest accordingly. Articulate approach to strategic compensation. The district should have a clear, fiscally-responsible approach to bargaining with labor partners and should communicate that approach more transparently with employees and the community to build understanding. Align priority investments to strategic planning and Superintendent’s work plan. The budget should support Superintendent Johnson-Trammell’s work plan and the development or refresh of OUSD’s strategic plan. If school communities will be undergoing transitions (mergers, consolidations, etc.) in the coming year, what supports will they receive and how will they be funded? How is the 2018-19 budget informed by the “cost of quality” discussions during the Blueprint process?